It takes around 30 years for the water used in Harvey’s beer to filter through the South Downs chalk to the well beneath the brewery. So, the pre-match pints gulped ahead of Brighton and Hove Albion’s debut Premiership clash, might have been brewed with the self-same water that clagged the mud to the boots of those players who, in 1983, crashed out of the old First Division. But a lot of rain has fallen since and, as the crowds gather, the scoresheet is blank once more. In the shadow of the Amex Stadium, I meet Harvey’s Bob Trimm who tells me that, as far as he’s aware, this is the only club in the Premiership with cask beer on draught at every match. 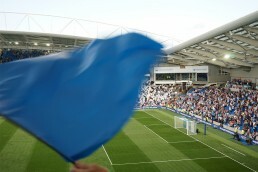 The Albion is certainly amongst only a handful of teams in the Premiership to serve cask beer and it seems that the fans want it: last season sales of Harvey’s reached 9000 pints at some matches — and with the addition of kegged beer this season, that’s likely to increase — making the Amex one of the biggest cask beer outlets in the world. Harvey’s most famous beer, their Sussex Best Bitter, was first brewed in the mid-1950s, at a time when footballers arrived at English grounds after putting in a full Saturday morning at work, and didn’t think twice about training in lead-weighted boots or playing on in goal with a broken neck. And it’s from this cloth that Harvey’s Best is cut. Harvey’s Best is a toffee-rich, uncompromising, stubborn kind of pint that brings together the copper and wood of the brewery with the leather and turf of the pitch. It holds a brief promise of funk from the famous Harvey’s yeast, along with the fruit-sweetness that marks the start of the English football season with overripe plums and russet apples, suggestive of snug scarves, conkers on strings and the fast-approaching, dark-by-teatime chill that accompanies the football results on television. The club and the beer inspire the same loyalty, and it is testament to the fans that they are both here, belonging together, in this patch of English countryside, between the sea and the Downs. And, negotiating that dance between emotion and rationality that fans of English beer and football both share, we head for another pint of Best, and I am convinced that he is right. Listen to Emma’s podcast Fermentation Beer & Brewing Show on Radio Reverb now. Great piece ! Beautifully written.